In the adventures of the Hobbit Bilbo, there’s is a great deal of talk about a certain artifact made by the dwarves. 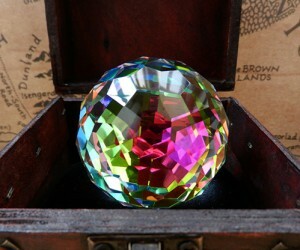 This Unique Arkenstone Replica has been made to resemble the one from the movie, the one that Bilbo tries to find and steal from the deadly dragon Smaug The Magnificent! Made from fine K9 Crystal, the Arkenstone comes in a wooden treasure chest along with Dwarven runes and a card of Authenticity.